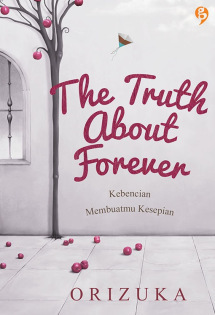 The Truth About Forever is 11th novel by Orizuka. Published by Gagas Media. The first printed in 2008 and a second printed in 2013. This novel has 301 pages thick. With no.ISBN 979-780-624-3. Yogas, the main character in this novel, has been on a verdict if it did not survive much longer. Yogas use the rest of his life which is not long for revenge against those who have made it to be suffering. He quietly went Yogyakarta, look for people who should be responsible for life and dreams have been shattered. In fact, if necessary Yogas willing to die with him. In the midst of his revenge, he meets a girl who desperately wants her stay away, he even tried to avoid him. Kana, how hard Yogas trying to stay away but somehow instead it makes it closer to the small-boned girl. Without him knowing the love that had been his grave deep in his heart slowly reappear. It’s time to make Yogas scrambling and momentarily forget revenge. But he still tried to focus her to find him, if you can kill him. Yogas are eager to avoid contact with Kana. Because he thinks it will make hassles. But, because they live close together, Yogas little trouble avoiding Kana. Yogas are being cold and mysterious look that only made more curious Kana. At first Cana also do not want to know the affairs of others. But somehow, as there is a magnet around an attractive Yogas Kana want to know more about it. Gradually, without realizing they become closer, than they imagined. Well … it is love that comes without giving square off. When they are aware of each other’s feelings, a lot of things and turmoil raging in the mind of each. Kana increasingly want to know more about the mysterious guy, which he called aliens during this. Yogas do not want to be a hindrance to her feelings for revenge. Finally Yogas trying to devise some false scenario to make Kana away from him. Start of the reasons why he wanted revenge and the reality of the beginning of why her life was destroyed like this. Kana initially believed to be the words of Yogas and begins to falter with feelings. Kana realized that he was not an angel who will be in addition to whatever happens Yogas. He was just an ordinary man who also has a fear. For a moment Yogas managed to make Kana away from him. But unexpectedly, it only made him afraid to be abandoned by Kana. But on the other hand he also feared that someday Kana will hurt if you know the truth about what happened to him. The power of love is incredible. Taxable no longer hesitated. He vowed to stand beside Yogas whatever happens. But Yogas still afraid that Kana was on his side, the future will be bleak Kana. On the other hand Yogas happy to know that there are still people who care for him. A major war in the heart Yogas. Finally she decided to throw her excitement and focus for revenge. Yogas Kana firmly rejected love, even several times said some cruel to him to make Kana cry. Although he did not want to make her cry, but she thinks that this is the best for him. One time all the truth comes out. Truth is arguably so bitter, but it only made Kana increasingly convinced that he would be in addition to whatever happens Yogas, and forever. Although repeatedly denied Yogas, but Kana never give up. He sincerely showing attention and affection on Yogas. At first Yogas do think that Kana solely because of compassion, but in time they could see the sincerity Kana Yogas and eventually received Kana. Yogas think that after meeting her, her life has changed. Becomes more meaningful. Kana was the one who made it back alive and eager to regain his dreams. Along with the many good things that welcomes Yogas. Amid perceived happiness Yogas, suddenly people who had ruined his life appeared. For a moment it made him angry and intended to kill him. Joe, he was the one who wanted to kill Yogas. People who have made the future of Yogas destroyed, the person who has made the people around him to get away. When Yogas almost would kill him, he forced Joe to explain the background of why he was the victim of injustice friend, Joe. Apparently after Joe explained, he did not know that the injection containing the drug, which he used to forcibly inject into the body Yogas, had been infected with the HIV virus. Joe does not think his actions had been excessive and lead to future best friend destroyed. Joe really regretted it and he said the reason why he did it. When high school students Yogas is highly respected, he aspires to become a film director, because he is very busy with his world so that there is a role that Yogas forget, that he pays little attention to his friend, Joe. Yogas often busied himself with his hobby of making a simple short film that makes Joe alone. Because that’s what Joe vent his frustration against Yogas the wrong way. From there, finally realized his mistake Yogas are not on Joe alone. Amid the precarious state, Yogas received a call from his father in Jakarta. Yogas eyes widened when he heard the sound of the telephone tip, he did not think his father would come back again after many years of leaving because of the disease. His father was very sorry and apologize to Yogas. Then father and mother told Yogas to immediately return to Jakarta and rebuild their lives. Knowing this, Kana strongly support parental decision Yogas, however Yogas should still live their lives, especially in school and could achieve his goal. Yogas conscious and eager to reach his goal but the one hand he did not want to leave Kana alone. Yogas finally decided to reach his goal. Then he promised to Kana that when they both had success, namely Yogas managed to become a director and Kana managed to become the best seller. When that time comes, they should meet again. But fate would, Yogas had already left Kana in an accident. “Gas, instead you most know if the HIV virus did not spread through saliva?” Kana said when Yogas asked that the former feeding equipment thrown away. In addition, the author can present the storyline forward and backward (flashback) with chronological easily understood by the reader. The language is also easy to understand, straightforward and not just rely on any stylistic hyperbole. The author also creates characters who are not too much so as not to confuse the reader, and the author can give a different character in each of the characters that have a distinctive character of each. Authors also have the confidence to make Yogyakarta, Indonesia as a background story in this novel because the author usually made abroad as a background story. Mandate contained in this excellent novel, the author tries to convey to the reader that revenge will not solve the problem, and how precious every second of that time, as in the quote in the book synopsis: How does one second worth it? Tik. Very soon he immediately passed. Tik. One second go again. Worthless. But wait until you realize that your time is running out. Tik. Do you remember during this rarely charity. Tik. You remembered the dreams that you could not make happen. Tik. Do you realize that’s not enough to love family and friends. Tik. Tik. Tik. You panic, fear of wasting more time. Although this genre of romance novels, but the dialogues and scenes too much between the main character and Kana Yogas so impressed just the two of them cast. But overall it was almost perfect novel. From the novel by Orizuka, I can take some important life lessons, one of which we should be forgiving, should not be a vengeful person, because it can make life in vain. Moreover, should not be a quitter or despair about something, especially verdict disease. During or soon we live, have ideals is an obligation for the sake of improving the spirit of life. In this Orizuka novel also presents a knowledge-knowledge about HIV / AIDS, so that the reader can at least know some facts related to HIV / AIDS itself.